I’m looking for two people to volunteer to write about Agile for this site. In particular, I’m interested in stories about Agile being used outside of technical fields and Agile being used in management. 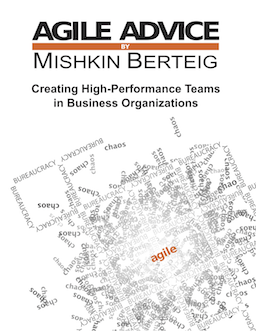 Of course, if you have a burning desire to write about something else, please let me know: mishkin@berteigconsulting.com. – You get to use any name or alias you wish, your authorship will be listed with each blog entry, and each entry you submit will link to a web page or email address of your choice. – You can include in your entries affiliate links for specific products related to your entry. – If you become a regular contributor (more than two entries per calendar month), I will include a link to a web site of your choice on the front page. – Entries are subject to editing or removal for any reason whatsoever. In general, if you are writing about something related to Agile, Teamwork, Process, Management, Learning, Community you should be okay. If I remove your entry, I will keep a backup copy of it. – You will not be paid by Agile Advice, Berteig Consulting Inc. or any affiliated web sites, companies or individuals for your entries submitted. You give Berteig Consulting Inc. a non-exclusive unlimited license to publish your entries to the Agile Advice web site and any derived works. – You must provide a permanent link from a web page of your authorship and choosing to the front page of Agile Advice. – Any questions you have about these terms should be directed to Mishkin Berteig by email: mishkin@berteigconsulting.com.